In this article we answer all your burning questions about the basic prinicples of land drainage. Plus it's all squeezed into a handy video aswell! Check out our basic guide to land drain which covers the two different types of land drain and how they work, where to use it, how to install it and how to make connections between land drianage pipes. But first things first lets go through some basic questions you may have about land driange! 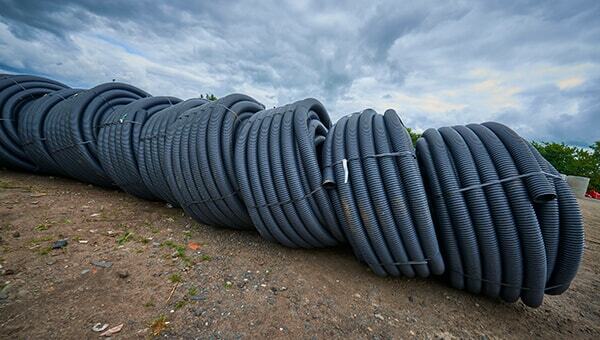 Land drain, often known as French Drain, is the name given to flexible coiled pipes which are laid underground to alleviate excess surface water. They are corrugated and come in either perforated or unperforated lengths. Coils are available from JDP in sizes varying from 60mm-160mm in 25m, 50m or 100m lengths. How do land drain pipes work? 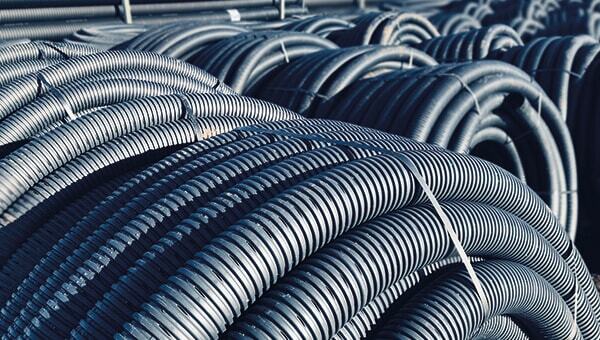 Land drainage is available in either perforated or unperforated lengths, each working in a slightly different way. Perforated land drain is used to collect water through the small holes located around the pipe; these holes allow water to seep from the ground into the pipe and be carried away or to percolate back into the soil at a practical rate. Find out which way these perforations should go when installing them. Unperforated land drain is used for distributing surface water, these pipes have no holes and the primary use is for attenuation; to redirect water to a watercourse such as a stream, river, water tank or soakaway. Land drain should only be used for surface water drainage, never for foul water. Where should I use land drainage? Land drain can be used in a variation of different applications from agriculture to construction, for different purposes. Perforated land drain is typically used to drain fields to improve soil quality and can also be used in sports fields and to drain domestic gardens. In construction land drain is used to remove surface water from around buildings to prevent flooding. With no land drainage in built up areas, standing water can increase the static load on underground structures and retaining walls, by installing land drain to remove the excess water this relieves the pressure. What colour are land drain pipes? 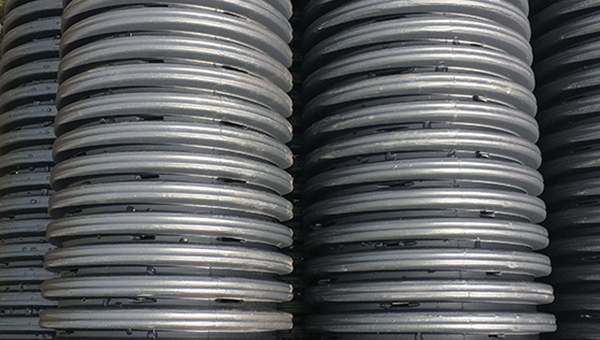 Land drain pipes are mostly typically manufactured in a black colour and so all of the land drain coils we stock are black on the inside and outside. This differs from other underground ducting , where the colour indicates the use of the duct (or what’s inside it). How to design land drainage? Typically, land drainage is arranged in a herringbone style with one central pipe and several branches coming out of this; this ensures the area is drained efficiently and maximises the effectiveness of the land drain pipes. How to lay land drainage? Land drainage is installed using the traditional trench method which is a relatively simple process. For more information about the install process check out our article which guides you through the process step by step. What stone backfill do you need for land drainage? A gravel backfill should be used in the trench and a small stone size is recommended. 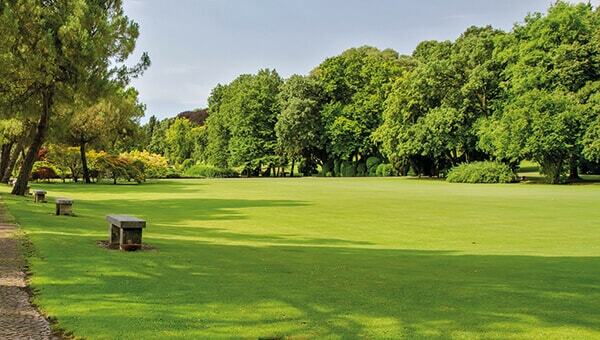 Find out which other products you need to install land drainage in our article 'Fixing drainage problems in your garden lawn'. Have a watch our our Basic Guide video which covers all the points above!